Teacher writes one social skill (cooperation, responsibility, integrity, etc) at the top of the T-Graph on YELLOW butcher paper. If yellow is not available, then any other light color butcher paper will do. 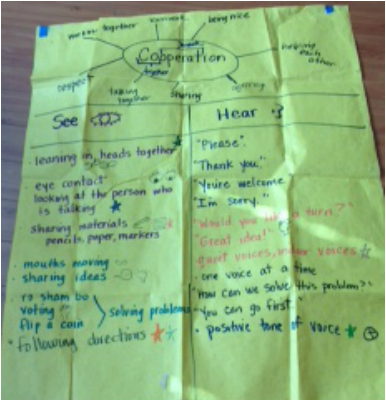 Teacher creates a web/mind map around the social skill word. Teams put heads together to brainstorm their definition/what they know about the social skill. Use the Numbered Heads strategy by pulling numbered sticks/spoons to hear an idea from each team of four. Teacher scribes one idea per team, around the mind map at the top of the T-Graph. The teacher writes the word See and a sketch of an eye below the mind map. Using Numbered Heads again, one student from each team offers a suggestion as to the positive behaviors that we would see in our classroom. Teacher writes ideas in the POSITIVE only. Example: If students says “ No fighting”. The teacher needs to help the student rephrase it to “Agreeing or getting along”. Add sketches and real pictures to help with comprehension. Teacher writes the word Hear on the right side of the T-Graph and sketches an ear. If the principal were to walk by, what kind of positive words would he/she would hear? Follow the same procedure as on the See side of the T-Graph. Students brainstorm, use Numbered Heads, teacher writes student ideas in the POSITIVE. Have students read the T-Graph aloud with you. REVISIT AND ADD ON MORE IDEAS EACH DAY…THIS IS A WORKING DOCUMENT. PLACE T-GRAPH IN FRONT OF THE ROOM, ALONG SIDE TEAM POINTS. Write name of each team on a large piece of YELLOW butcher paper and place it right next to the T-Graph. Once the positive behaviors are on the T-Graph, teams begin earning team points as they exhibit those behaviors on the chart. For example: “Red team, you have EARNED five points for having heads together” or “Blue team, you have EARNED ten points for having eyes on the speaker”. You may actually touch the T-Graph that states the positive behavior as you are positively reinforcing the teams. K-1 Teachers, teach the students how to tally and count by 5’s. 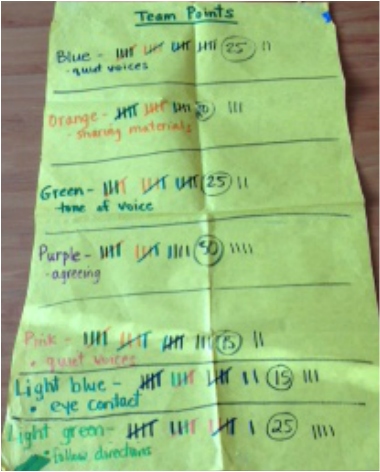 Pass the marker…have students help with writing up the team points. Add up the points at the end of the week and start with a clean slate every new week. Teams reflect on their behavior and team work. Teams choose one behavior from the T-graph that they are doing well. Teacher writes a star in their team color on the T-Graph to highlight the positive. Teams earn BONUS POINTS if they work toward their chosen goal.